Welcome to this week’s edition of The Friday Five! The Friday Five is a feature that I post every Friday in which I give my thoughts on a topic that’s related to NBA Live, NBA 2K, and other basketball video games, as well as the real NBA, and other areas of interest to our community. The feature is presented as either a list of five items, or in the form of a Top 5 countdown. As I’ve mentioned a few times in recent episodes of the NLSC Podcast, I’ve been finding myself in a bit of a basketball gaming rut as of late. As much as I like NBA Live 16 and NBA 2K16 for what each title brings to the table, I haven’t been spending as much time with them as I’d like. This is partly due to the fact that I’ve been playing older versions of NBA Live to create content for our 20th Anniversary of NBA Live features, but on top of that, I’ve also found myself a little unsure of what I actually want to do with the most recent releases from EA Sports and Visual Concepts. First world problems, I know. In any event, I’ve been thinking of what I can do to get out of this rut, and spend some more quality time with the latest basketball games. I’m sure that I’m not the only one who experiences occasional lulls in my basketball gaming habits, so I thought that I’d discuss the topic openly in this week’s Friday Five, and perhaps start a conversation that will help anyone else who feels like they’re in a bit of basketball gaming rut. With that said, here are five suggestions to tip things off. The most obvious suggestion is to try another game mode. We’ve come a long way since the days when basketball video games basically just offered exhibition and season play, and at times, the choice can probably seem overwhelming. I think that most of us gravitate towards one or two modes at most each year, then subsequently devote most of our basketball gaming time to them. Needless to say, there comes a point where we feel that we’ve done all that we possibly can with a particular mode; or, more unfortunately, our patience with a mode’s shortcomings finally wears thin. Either way, it’s time for a change. I’m always a little perplexed when I see basketball gamers say that game modes don’t matter. Obviously, gameplay is paramount, but the modes are what add longevity to sports titles, providing an incentive to keep playing them for months on end. Well, I suppose you could just play other gamers online, but as I’ve noted in the past, I don’t have a lot of luck with that. Anyway, it’s great when you can get hooked on a mode, so if you’re no longer feeling gripped by what you’ve been playing, check out what else is on offer. You might find that a certain mode holds more appeal than you first thought, providing you with a couple of different options for future gaming sessions. I admit that this idea may not work for everyone, because old favourites don’t always age well, and not everyone has a fondness for retro gaming. However, I do find that I can go back and play older basketball games – certain titles, at any rate – and still have a lot of fun. My past experiences with losing saved games has led to me being very mindful that there may be times when I want to pick up where I left off every now and again, so I’ve been careful to keep backups of some of my favourite games. 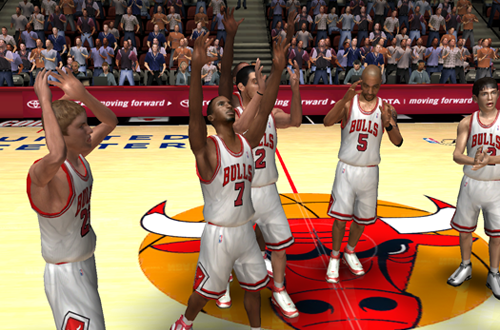 I’ve spoken about my fondness for my NBA Live 06 Bulls Dynasty several times, and it’s a save that I’ll gladly revisit from time to time. Similarly, if you have large collection of basketball games, as I do – or even just a handful of older games at your disposal – you may want to give a second look to a game you didn’t pay much attention to the first time around. 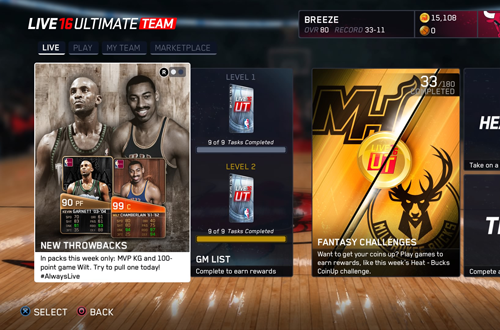 On the surface, these may not sound like ideal ways to get back into NBA Live 16 and NBA 2K16, but I believe that revisiting an old favourite is a good first step in reigniting one’s enthusiasm for basketball gaming. Furthermore, you’ll come to a point where the outdated elements of those older games will make you want to fire up the latest releases, now with a renewed interest in balling on the virtual hardwood. Presumably, most people who play basketball video games do so because they have a strong interest in the sport itself. If you’re playing NBA Live and/or NBA 2K, you probably have more than a passing interest in what’s happening in the real National Basketball Association. For people who are passionate about the NBA and the video games based on it, I have to believe that the two interests inspire enthusiasm for the other. When you’re having fun with a basketball game, you get invested in what’s happening with the real teams and players as well. Likewise, when you’re excited by what you see on TV or online, you want to see if you can replicate it in a video game. I touched on it during Episode #156 of the NLSC Podcast, but I believe that’s been one of my problems this year. I’ve just not felt as invested in the 2016 season as I would have liked, and I’ve definitely had trouble getting excited about the Playoffs so far. To that end, it might help a little if NBA Live 16 or NBA 2K16 had a standalone Playoffs mode that I could jump right into, but even so, I haven’t really been “feeling” this season. Hopefully, as the Playoffs roll on and I try a few things in both games, I’ll feel my enthusiasm return. We tend to develop habits with basketball video games, a specific way that we prefer to play them. That isn’t necessarily a bad thing, but always running with the same approach can end up becoming a little stale, even if it’s usually been enjoyable in the past. Should your traditional approach to basketball gaming feel a little dull, it might be time to change things up with a fresh idea, perhaps something a little crazy. Just how crazy you get is entirely up to you, and you’ll need to find the right balance. In my experience, as someone who prefers more of a sim approach, getting too silly can definitely lead to the novelty wearing off very quickly. Nevertheless, it’s an opportunity to be creative, and experience basketball games in an entirely new way. 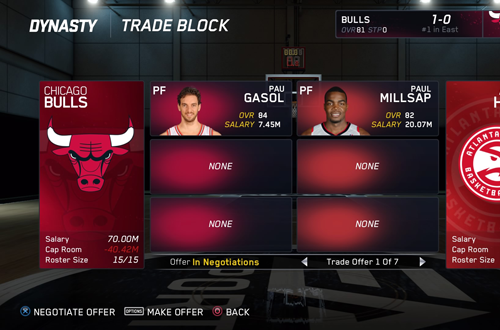 By all means, keep your franchise mode save where you’re taking a more serious approach; don’t mess that one up. Instead, start a brand new game alongside it, in which you wheel and deal your way to an interesting lineup. Alternatively, select a team that you normally wouldn’t play with, and see where that leads you. Perhaps have one of your players put up historical numbers. If you’re playing a career mode, try changing up the way you role play as your player. Above all, remember that it’s a video game: you can easily start over if it’s not working out. Finally, if you’re a little bored with basketball games, or simply unsure of what to do with them next, try challenging yourself to attain trophies and achievements. I know that not everyone is a fan of the concept, but I’ve personally found some satisfaction in striving for them from time to time, and not just in basketball games. I like the way that they can point you in the direction of fun challenges and elements of the game that you may have overlooked, as well as that sense of accomplishment you feel when the notification pops up on the screen. Whoever came up with the concept, they knew what they were doing. I’ve saved this suggestion for last, because it kind of ties into most of the other ideas that I’ve discussed here. If you decide to dust off an old game, you might want to try to attain some of the trophies/achievements that you missed out on the first time around. Certain trophies and achievements may require you to explore game modes that you haven’t really spent much time with. And of course, some challenges may simply require you to do things that are a little different to the way that you normally play the game. If you need to get hooked on a game again, or get as much out of the experience as you can, trophies and achievements can be effective incentives. 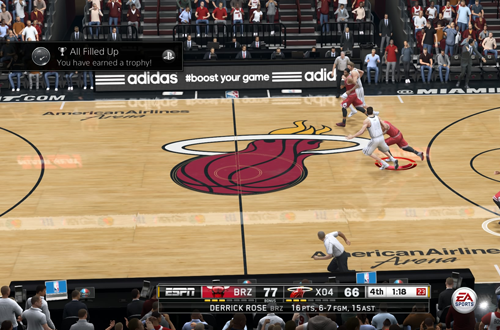 What do you do when you find yourself stuck in a basketball gaming rut? Are any of these suggestions helpful to you? Let me know in the comments section below, and as always, feel free to take the discussion to the NLSC Forum! That’s all for this week, so thanks for checking in, have a great weekend, and please join me again next Friday for another Five. These are all great suggestions. As for having to find or even kind of force myself to get out of a rut, I feel that’s when a person should know it may be just time to take a break from it. I personally got burnt out from the pressure I put on myself with streaming for the Stream Team to the point that I felt I wasn’t really gaming anymore. Now I find myself playing games I may not have ever even given a chance before like The Division and I just picked up Fallout 4 on Xbox yesterday and I’m starting off with 3 since I never got around to beating that game on PC as it was and still is problematic with freezing issues. We all love basketball in here. Some more than others. I naturally pick up a game or two on both Live and 2K now. I was hooked on Live after a couple months break. Matter fact, I posted it in the forums about my newfound joy for Live. Anyway, here’s to hoping we get some news and confirmation that Live 17 will be at the Eplay event this year. Very true. You can definitely experience burnout, at which point it is time to play something else. In my case, I would actually like to play the basketball games more often, but I’ve been struggling to choose a mode to get invested in. On the bright side, I think I might be able to have some fun with both games this weekend, with some of these ideas. I also played some 2K Pro-Am for the first time with a few friends last night, and that’ll be something else I’ll try to do from time to time. I tried breaking my rut on both games by trading Melo from the knicks, easy to do on 2k but not so much on Live for some reason the cpu just doesn’t want to take on a big contract. After listening to the podcast today you guys got my thinking about if I am getting my money’s worth out of the games too, myleague Yes, mygm not as much, my career – well spike Lee killed that for me and I haven’t brushed on myteam at all. As for Live I thought about Rising Star a go along with starting a playoff team dynasty hence my podcast question this week. For me breaking a rut usually comes after the trade deadline/playoffs/Draft or just using a team that I’d never usually play with. Absolutely, that’s one of the things I was alluding to in my third point this week. It’s why I’d really like to see All-Star Weekend and a standalone Playoffs mode back in the game; at those times of the year, it’s great to be able to jump in and play those games and events in NBA Live and NBA 2K. Most of these reasons are exactly why I stick to playing 2K11 than the newer games. The game offered more modes to keep me as a gamer from getting bored of the content. What I particularly like was the “situation” mode where you set the remaining time and score before playing through the settings. This relates to your 3rd point, since the mode allows you to recreate classic basketball moments like the Shot on Ehlo, 13 in 33, Curry’s 37-foot shot, Kyrie’s Game 4 dagger this year, and many more. 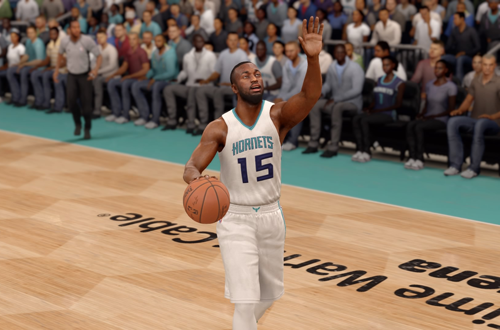 BIG Moments in NBA Live 16 also offer that opportunity, though there has been problems with consistency in updates this season. I don’t feel like I have a lack of choices as far as modes in the latest games; my main problems are that I’m not really sure what I want to do, and I haven’t been able to get too excited about the 2016 season in general, so the interests haven’t been able to feed off one another.